By illconsidered on June 16, 2014. 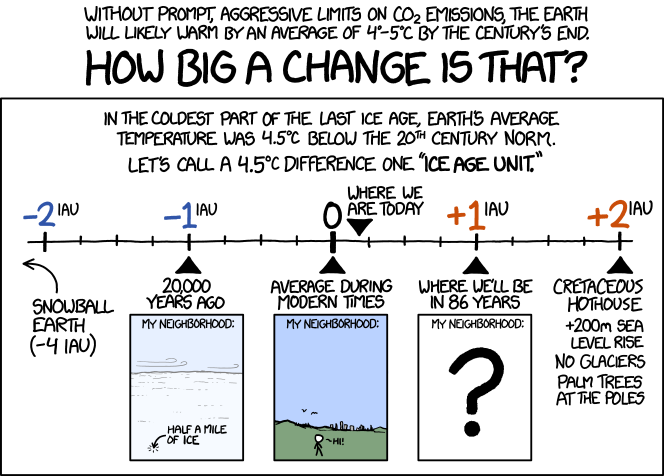 2014/06/10: TreeHugger: (cartoon - Munroe) How big a change would 4.5 degrees celsius be? Talks in Bonn have delivered no progress on delivering climate finance, says LDC negotiator Countries have ploughed on with the task of creating a new UN climate treaty over the past two weeks in Bonn, but a lack of money is still hampering progress, say the world's poorest countries. 2014/06/13: BBC: Will a new climate fund unlock a global deal? As UN climate talks continue in Bonn, money is emerging as a critical element in getting the world to agree on a new deal by the end of next year. 2014/06/11: RTCC: Time for farming to be taken seriously at UN climate talks? In the Mexican Congress at the 2nd World Summit of Legislators (WSL) 2014 organized by the London-based GLOBE International - nearly 300 senior legislators and scientists from more than 70 countries, including Speakers of Parliaments and Presidents of Congress, brainstormed to formulate a resolution on climate change legislation. Domestic laws should be 'at the heart' of Paris agreement, say 400 lawmakers from 80 countries MPs from 80 countries have agreed to push for tougher climate change legislation in their domestic parliaments. Pacific leaders have criticised Australia's moves to form a conservative international climate change alliance, saying it will only isolate Australia further in the Pacific. London wants leaders in Canberra and Ottawa to play 'responsible proactive' role in curbing global greenhouse gas emissions UK climate and energy minister Greg Barker has laughed off suggestions the country could enter into an alliance against climate regulation with Australia and Canada. 2014/06/13: Grist: Will EPA's power plant regulations be stopped in the courts? 2014/06/11: EnergyPost: Perspectives on Obama's clean power plan: "it beats doing nothing"
In calculating the costs and benefits of its new climate rule, the EPA figured in measures 'to reflect the global nature of the problem,' the agency said. 2014/06/09: GreenGrok: Obama's New Carbon Rules: What Price Regulation? 2014/01/19: Nature: (ab$) Increasing frequency of extreme El Niño events due to greenhouse warming by Wenju Cai et al. 2014/06/11: Nature: (ab$) Increased frequency of extreme Indian Ocean Dipole events due to greenhouse warming by Wenju Cai et al. An atmospheric phenomenon in the Indian Ocean could increase under climate change tripling droughts and bushfires across the globe. Climate change is likely to almost triple the frequency of bushfires, floods and drought in Australia from one event every 17 years to one every 6 years, according to a paper published today in Nature. The Energiewende is Germany's poster child. No wonder, a guidebook which details nearly 200 renewable energy sites is selling well. Komila Nabiyeva reports from Berlin. 2014/06/12: GEB: FAZ: Uniform Renewables Surcharge of 40% for Self-consumed Power of New Renewable Power Plants? The next phase of Germany's energy transition takes competitive markets into account. This way, the German Energiewende could look more American, argues Betham Paulos. 2014/06/09: EnergyPost: The Trillion-Dollar Question: Is Big Oil over-investing in high-cost projects? Think tanker scorns IMF, World Bank economists (and my Tyee piece). 2014/06/10: WUWTWatts: Richard Tol's big mistake, or malicious behavior? 2014/06/15: EneNews: Japan Paper: "Horses became weak and died, one by one, from an unknown cause" at farm in Fukushima -- Farmer: "There is something seriously wrong going on..."
Two robots are cleaning up contamination inside Fukushima Daiichi 2. A new one is wiping down the walls while another continues to scrub the floor. Tokyo Electric Power Co. will deploy a second system to strip a dangerous isotope from water stored at its wrecked Fukushima nuclear facility, as it struggles to overcome problems with its existing water processor. The utility known as TEPCO has signed a contract with Kurion Inc. to remove strontium from about 400,000 metric tons of radioactive water stored at Fukushima using truck-mounted filters, the Irvine, California-based company said in a statement today. Kurion's equipment will be used alongside the site's ALPS processors, which have been prone to stoppages. The Toshiba Corp. system is designed to remove strontium, linked to bone cancer, and 61 other isotopes from water contaminated by contact with highly radioactive reactor fuel. Japan will introduce legislation this year to ratify a controversial treaty backed by General Electric Co. and other atomic-plant manufacturers seeking protection from damage claims caused by nuclear accidents. The treaty, known as the Convention on Supplementary Compensation for Nuclear Damage or CSC, will encourage experienced U.S. companies to assist in the cleanup and decommissioning at the Fukushima atomic accident site, Japan's Foreign Ministry said in a statement today. 2014/06/11: Dosbat: Watch this space..
2014/06/14: CCP: "West Antarctica has tipped and there isn't anything we can do about it." 2014/06/14: PSinclair: "We Don't Know what Normal is Anymore." UK supermarket launches climate adaptation plan to address growing concerns over supply chain Global warming is likely to make sourcing large supplies of fresh fruit and vegetables harder and more expensive, says leading supermarket chain Asda. 2014/06/11: MoJo: Will California's Drought Bring About $7 Broccoli? The end of cheap fruits and veggies draws nigh. Here's why. 2014/06/10: PLoS:Biologue: How Will We Feed the World? Pacific island nations have announced plans to dramatically increase the fees they charge tuna fishing boats for the right to enter their waters, saying it will boost revenue and help conservation efforts. Around half the world's skipjack tuna, the most commonly canned variety, is caught in waters belonging to an eight-nation group known as the Parties to the Nauru Agreement (PNA), which opened its annual meeting in Majuro today. Experts at the World Aquaculture Conference in Adelaide have unveiled a draft code for growing seafood sustainably. The conference is being held in Australia for the first time this century. The new code would provide labelling, sourcing, and certification benchmarks for the seafood industry globally. 2014/06/09: StLouisFed: Why Have Food Price Fluctuations in the U.S. and China Become More Correlated? Angering both sides of a fractious debate, the European Union's member states agreed today on a plan allowing individual countries to refuse to plant E.U.-sanctioned genetically modified (GM) crops. Many European consumers and national governments have voiced strong concerns about GM foods, with sharp divisions across the bloc hampering regulatory decisions. As one of the preconditions to authorizing close to $300 million in aid, the United States is pressuring El Salvador to purchase genetically modified seeds from Monsanto instead of non-GM seeds from local farmers. According to Sustainable Pulse, a website covering developments related to genetically modified organisms and sustainable agriculture, the US will reportedly withhold $277 million in aid through the Millennium Challenge Compact if El Salvador refuses to purchase GM seeds from the biotech company Monsanto. New Consumers Report poll finds that 92 percent of respondents want the government to require labeling of genetically engineered foods. A unique food bank in Niger supported by supported by the International Fund for Agricultural Development (IFAD) is reducing the impact of the food crisis on local communities and allowing local farmers to focus on cultivating their own fields. The banks -- run exclusively by women -- provide poor farmers with access to cereal grains when there are seasonal (the period of hunger preceding harvest from mid-July to mid-September) or unexpected food shortages. More than 50,000 women are involved in the management of the banks, and during the rainy season, the women organize weekly distributions of cereals. A new study examined the mineral micronutrient content of four types of grain legumes. Grain legumes are often overlooked as valuable sources of micronutrients, such as zinc and potassium. South China's Fujian Province has relocated about 28,000 offshore staff to get them out of the path of the approaching tropical storm Hagibis, said provincial authorities on Sunday. The provincial weather bureau sounded the first typhoon alarm on Saturday morning. Hagibis is likely to make landfall in the coastal areas between Fujian and neighboring Guangdong Province before midnight on Sunday, said the provincial flood control office. Summer rains delayed as Northern India experiences its worst heatwave in over 60 years. Australia may have already entered into the early stages of an El Nino weather pattern, increasing the possibility of drought and lower-than-average rainfall, an expert says. 2014/06/12: ABC(Au): El Nino in 2014 - what are the odds? 2014/06/14: QuarkSoup: When Have 17-year Trends Been Significant? 2014/06/10: GLaden: Are we warm yet? A major fossil discovery sheds new light on the origin and development of the earliest vertebrates. 2014/06/13: CNN: Namibia's 'fairy circles': Nature's greatest mystery? Wildlife regulator warns of "industrial-scale" poaching, but hails crackdown on smuggling of ivory. The survival of Africa's elephants is under threat, with estimates suggesting more than 20,000 were killed in 2013, a report says. The office of the Convention on International Trade in Endangered Species (Cites) said poaching levels were far above the elephant birth rate. 2014/06/12: SciAm:EC: Should We Stop Selling Nautilus Shells? 2014/06/11: Vox: The world is on the brink of a mass extinction. Here's how to avoid that. Organisers of the UK's first nation-wide bee count hope a new smartphone app will create a buzz among the nation's citizen scientists. They hope thousands of people will log their sightings in order to give scientists a vital insight into the health of bee populations. There is growing concern about wild bee numbers, as many species have recorded a serious decline in recent years. Swarms of giant moths have descended on Malaysia, invading homes and even disrupting a national football match. Thousands of the furry insects, with a wing span of up to 16cm (6in), interrupted a semi-finals match at the Darul Makmur Stadium last week. Deforestation is reducing the amount of leaf litter falling into rivers and lakes, resulting in less food being available to fish, a study suggests. 2014/06/10: TreeHugger: Stopping tropical deforestation is even more important than we thought! [...] Since the beginning of the industrial age, 30% to 60% of the coral reefs on the planet have disappeared because of human activity and warming oceans. President Tong says islands will be "annihilated" regardless of action from US and China It is already too late to save many small island states from being swamped by rising seas, according to the president of Kiribati. 2014/06/12: TreeHugger: After decades of stagnation, fuel economy finally climbing in the U.S.
Network Rail has reported a pre-tax profit of £1.035bn for the year to 31 March compared with restated profits of £747m a year earlier. The infrastructure group said the rail network was enjoying a "renaissance", with train passenger numbers at an all-time high. Carbon capture and storage (CCS) is sometimes touted as a promising technology for the future. But as Craig Morris points out, the technology is nothing new; it simply does not exist the way it is portrayed. Recent events in Canada and the US suggest that Germany's lack of interest is sensible. 2014/06/12: WoL:JGRA: (ab$) Key factors governing uncertainty in the response to sunshade geoengineering from a comparison of the GeoMIP ensemble and a perturbed parameter ensemble by Peter J. Irvine et al. 2014/06/14: WaPo: We don't need to think big about climate change. We need to think small. The hunt for oil is to be halted in Africa's oldest national park in eastern Democratic Republic of Congo, a UK-based oil firm has said. Virunga National Park is a Unesco World Heritage site and home to more than 200 endangered mountain gorillas. Soco International made the concession after the WWF filed a complaint that the company was violating good business practice guidelines. 2014/06/12: TP:JR: Is Africa's Oldest Park [Virunga National Park] Finally Safe From Oil Drillers? 2014/06/10: HESS: Development of a zoning-based environmental-ecological coupled model for lakes: a case study of Baiyangdian Lake in northern China by Y. W. Zhao et al. 2014/06/10: HESSD: Use of field and laboratory methods for estimating unsaturated hydraulic properties under different land-use by S. Siltecho et al. 2014/06/10: TCD: Glacier area and length changes in Norway from repeat inventories by S. H. Winsvold et al. 2014/06/10: PNAS: (ab$) A forager-herder trade-off, from broad-spectrum hunting to sheep management at Asikli Höyük, Turkey by Mary C. Stiner et al. 2014/06/10: PNAS: (abs) Commonness and rarity in the marine biosphere by Sean R. Connolly et al. 2014/06/10: PNAS: (ab$) Chaos-order transition in foraging behavior of ants by Lixiang Li et al. 2014/06/10: PNAS: (abs) Global evaluation of biofuel potential from microalgae by Jeffrey W. Moody et al. 2014/06/10: PNAS: (abs) Multiscale observations of CO2, 13CO2, and pollutants at Four Corners for emission verification and attribution by Rodica Lindenmaier et al. 2014/06/10: PNAS: (letter$) Reply to Liu: Amino acid 104 asparagine/glutamic acid of p53 is an adaptively selected site for extreme environments in mammals of the Tibet plateau by Yang Zhao et al. 2014/06/11: ACP: Estimating Asian terrestrial carbon fluxes from CONTRAIL aircraft and surface CO2 observations for the period 2006-2010 by H. F. Zhang et al. 2014/06/11: ACP: WAIS Divide ice core suggests sustained changes in the atmospheric formation pathways of sulfate and nitrate since the 19th century in the extratropical Southern Hemisphere by E. D. Sofen et al. 2014/06/10: ACP: What controls the recent changes in African mineral dust aerosol across the Atlantic? by D. A. Ridley et al. 2014/06/10: ACP: Global emission projections for the transportation sector using dynamic technology modeling by F. Yan et al. 2014/06/12: ACPD: Determination and climatology of the planetary boundary layer height by in-situ and remote sensing methods as well as the COSMO model above the Swiss plateau by M. Collaud Coen et al. 2014/06/11: ACPD: Characterization of road freight transportation and its impact on the national emission inventory in China by X. F. Yang et al. 2014/06/10: ACPD: On the use of satellite remote sensing based approach for determining aerosol direct radiative effect over land: a case study over China by A.-M. Sundström et al. 2014/06/12: Nature:Materials: (ab$) Air-stable n-type colloidal quantum dot solids by Zhijun Ning et al. 2014/06/13: BG: Impacts of extreme precipitation and seasonal changes in precipitation on plants by M. J. B. Zeppel et al. 2014/06/11: BG: Determining the optimal nitrogen rate for summer maize in China by integrating agronomic, economic, and environmental aspects by G. L. Wang et al. 2014/06/13: BGD: Technical Note: Linking climate change and downed woody debris decomposition across forests of the eastern United States by M. B. Russell et al. 2014/06/13: BGD: Water-saving ground cover rice production system reduces net greenhouse gas fluxes in an annual rice-based cropping system by Z. Yao et al. 2014/06/12: BGD: Quantifying legacies of clearcut on carbon fluxes and biomass carbon stock in northern temperate forests by W. Wang et al. 2014/06/12: BGD: Positive feedback of elevated CO2 on soil respiration in late autumn and winter by L. Keidel et al. 2014/06/11: BGD: How drought severity constrains GPP and its partitioning among carbon pools in a Quercus ilex coppice? by S. Rambal et al. 2014/06/11: BGD: Oxygen and carbon isotope composition of modern planktic foraminifera and near-surface waters in the Fram Strait (Arctic Ocean) - a case-study by T. Pados et al. 2014/06/11: BGD: Projected pH reductions by 2100 might put deep North Atlantic biodiversity at risk by M. Gehlen et al. 2014/06/11: CP: Centennial-scale variability of the Southern Hemisphere westerly wind belt in the eastern Pacific over the past two millennia by B. G. Koffman et al. 2014/06/10: CP: Past freeze and thaw cycling in the margin of the El'gygytgyn crater deduced from a 141 m long permafrost record by G. Schwamborn et al. 2014/06/13: ACP: Variations of oxygen-18 in West Siberian precipitation during the last 50 years by M. Butzin et al. 2014/06/13: GMDD: Including a full carbon cycle into the iLOVECLIM model (v1.0) by N. Bouttes et al. 2014/06/11: GMDD: Parameters sensitivity analysis for a~crop growth model applied to winter wheat in the Huanghuaihai Plain in China by M. Liu et al. 2014/06/11: GMDD: The impact of aerosol optical depth assimilation on aerosol forecasts and radiative effects during a wild fire event over the United States by D. Chen et al. 2014/06/13: HESS: A prototype framework for models of socio-hydrology: identification of key feedback loops and parameterisation approach by Y. Elshafei et al. 2014/06/13: HESSD: Climate change impacts on the seasonality and generation processes of floods in catchments with mixed snowmelt/rainfall regimes: projections and uncertainties by K. Vormoor et al. 2014/06/11: OSD: Detailed temperature-salinity distribution in the Northeast Atlantic from ship and Argo vertical casts by I. Bashmachnikov et al. 2014/06/11: OSD: Forecasting the mixed layer depth in the north east Atlantic: an ensemble approach, with uncertainties based on data from operational oceanic systems by Y. Drillet et al. 2014/06/11: TC: Surface kinematics of periglacial sorted circles using structure-from-motion technology by A. Kääb et al. 2014/06/11: TC: The sub-ice platelet layer and its influence on freeboard to thickness conversion of Antarctic sea ice by D. Price et al. 2014/06/13: TCD: A novel integrated method to describe dust and fine supraglacial debris and their effects on ice albedo: the case study of Forni Glacier, Italian Alps by R. S. Azzoni et al. 2014/06/13: TCD: Independent evaluation of the SNODAS snow depth product using regional scale LiDAR-derived measurements by A. Hedrick et al. 2014/06/11: TCD: Quantifying mass balance processes on the Southern Patagonia Icefield by M. Schaefer et al. 2014/06/11: PLoS One: Seasonal Distribution and Historic Trends in Abundance of White Sharks, Carcharodon carcharias, in the Western North Atlantic Ocean by Tobey H. Curtis et al. 2014/06/11: Nature:Comm: (abs) Forests fuel fish growth in freshwater deltas by Andrew J. Tanentzap et al. 2014/06/08: Nature:GeoSci: (ab$) Contribution of light-absorbing impurities in snow to Greenland's darkening since 2009 by M. Dumont et al. 2014/06/08: Nature:CC: (ab$) Payback time for soil carbon and sugar-cane ethanol by Francisco F. C. Mello et al. 2014/06/08: Nature:CC: (ab$) Effects of double cropping on summer climate of the North China Plain and neighbouring regions by Su-Jong Jeong et al. Pressure growing on EU as internal rows force bloc to postpone backing of key UN treaty Norway has become the 11th country to ratify an eight-year extension to the UN's Kyoto Protocol. Ohrid and Prespa region in the southeastern Balkan area was named the cross-border biosphere reserve by UNESCO's international Coordinating Council of the Man and the Biosphere (MAB) Program at a meeting held in Sweden, Macedonia Information Agency reported on Wednesday. The Ohrid Prespa region known for limestone cliffs with caves and mountain massifs are the ecologically precious area on the European green belt in the Balkans. This new title for the Ohrid Prespa region will attract world's attention and is expected to bring new commercial opportunity as well as more environmental protection. With the deadline to expand the cap-and-trade program less than six months away, energy companies are urging the two governments to pull back. United Nations carbon regulators will consider new rules next month to make it easier for China to switch emission-reduction projects from the Clean Development Mechanism to a new domestic offset program. A small levy should be imposed on fossil fuel giants to pay for the loss and damage caused to people the world over from the burning of their product. 2014/06/13: CSM: Carbon pricing won't solve climate change. Innovation will. Despite "differences of views" over Iran's nuclear issue, it is "possible" for a comprehensive deal between Iran and the P5+1 group, namely Britain, China, France, Russia, the United States plus Germany, before July 20, Iranian President Hassan Rouhani said on Saturday, the first anniversary of his presidential victory. Tehran - Iranian Foreign Minister Javad Zarif has revealed for the first time that Iran has made a detailed proposal to the P5+1 group of states aimed at ensuring that no stockpile of low-enriched uranium would be available for "breakout" through enrichment to weapons grade levels. The talks between the representatives of Iran and Russia over Iran's nuclear program were fruitful, Pess TV reported on Thursday quoting a senior Iranian nuclear negotiator. Top US and Iranian diplomats are wrapping up a bilateral meeting abruptly convened amid worries that disagreements at the negotiating table threaten a final nuclear deal next month. Steady momentum toward a deal dropped off last month after Iran and six world powers accused each other of imposing unrealistic demands on each other. The unplanned meeting yesterday and today indicates the magnitude of the hurdles that remain, as diplomats seek a compromise to get negotiations back on track. Japan's former Prime Minister Yukio Hatoyama criticized Japan's current military stance, saying the "active pacifism"created by Prime Minister Shinzo Abe is a blinkered concept and, therefore, can not bring real peace to the Asian-Pacific region. The United States is pushing both the Philippines and Vietnam to confront China in the South China Sea as part of the "pivot to Asia" aimed at undermining Beijing and strengthening US control over the region. China is applying to UNESCO to list 11 sets of documents relating to the 1937 Nanjing Massacre on the Memory of the World Register. The documents are first-hand materials that recorded the massacre, and are of historical importance, said Zhu Chengshan, curator of the memorial hall of the victims, on Wednesday. A chilling exchange occurred during an Australian Senate estimates committee hearing last week about the likelihood of Australia being on the front line of a war between the US and China or between Japan and China. The little-reported discussion took place on June 2, two days after US Defense Secretary Chuck Hagel delivered a menacing and provocative speech in Singapore accusing China of "destabilising, unilateral actions asserting its claims in the South China Sea." Speaking at the Shangri-La Dialogue, the annual Asian defence forum, Hagel issued what amounted to a threat of war, declaring that the US "will not look the other way when fundamental principles of the international order are being challenged." Hagel cast off Washington's pretence of neutrality in the maritime territorial disputes involving China in the South and East China Seas. He charged Beijing with "intimidation and coercion" in the South China Sea, directed against the Philippines and Vietnam. In reality, as part of its military and strategic "pivot" to Asia, the Obama administration has encouraged Southeast Asian countries, particularly the Philippines and Vietnam, to aggressively press their claims against China. As a result, low-level regional disputes have been transformed into dangerous international flashpoints. Tokyo lodges diplomatic protest with Beijing after Chinese jets fly 30 metres from Japanese planes over East China Sea. The United Nations says it is willing to mediate in the territorial row between China and Vietnam. UN spokesman Stephane Dujarric called for both sides to resolve the dispute peacefully and legally. In the past week, Vietnam and China have both sent dossiers outlining their claims in the South China Sea to UN chief Ban Ki-moon. Vietnam said China again shifted an oil rig it has placed in disputed waters, with six warships guarding the structure as the two communist countries continue their South China Sea stand-off. The rig was moved for a third time and remains off Vietnam's coast in an area claimed by both countries, the official Vietnam News reported, citing information from the Vietnam Fisheries Surveillance Department. There are now six Chinese warships, 38 coast guard vessels, 13 cargo ships and 19 tugboats protecting it, the paper said. Chinese official says Vietnamese vessels have rammed ships close to an oil platform in disputed part of South China Sea. Chinese officials have accused vessels from Vietnam of launching more than 1,400 ramming raids on its ships near a drilling rig in the South China Sea. The foreign ministry said in a statement the actions were illegal and called on Hanoi to stop "provocations". Russia's President Vladimir Putin has said a gas price discount deal offered to Ukraine was designed to help its economy. After another round of negotiations, Ukraine rejected the price deal, saying it "won't fall into Russian gas trap". 2014/06/11: PLNA: Russia Demands Gas Payments to Ukrainia, No Agreement Yet. Gazprom will not be introducing a gas pre-payment method for Kiev on Wednesday after Ukraine missed the June 10 deadline to repay its debt. The deadline has been extended to June 16, Gazprom CEO Aleksey Miller said. Serbia says it may have to suspend construction of the South Stream gas pipeline through its territory, after Bulgaria said it was halting work on its segment of the pipeline. Following trilateral talks on gas pricing involving Russia and Ukraine and hosted today (11 June) by the European Commission, Yuri Prodan, the Ukrainian energy minister, told EurActiv that Russia obstructed progress on purpose, as it wanted to convince its EU partners about the advantages of the Gazprom-favoured South Stream pipeline, which is intended to bypass Ukraine. Prodan made this comment as he walked out of the Commission headquarters, where he had been negotiating for several hours with his Russian counterpart Alexander Novak, and Gazprom CEO Alexei Miller. The talks were hosted by Energy Commissioner Günther Oettinger. The US is trying to halt the South Stream project aimed at supplying Europe with gas as it hopes this would have an adverse economic effect on Russia, former Assistant Secretary of the Treasury Paul Craig Roberts told RT. South Stream gas pipeline is irreversible, Bulgaria's Energy Minister Dragomir Stoynev said Monday, stressing that Bulgarian authorities have not given up plans to proceed with the project. The minister's comment comes after Sunday's announcement that the country's premier Plamen Oresharski ordered a halt to the Russian Gazprom-led project which faces pressure from the EU. Russia has accused the European Union of imposing "creeping" economic sanctions following Bulgaria's decision to halt construction of a gas pipeline. Negotiations in Brussels set to resume after talks failure raises risk of gas-supply disruption to EU member states. Sofia, Bulgaria - Bulgaria's prime minister has ordered on Sunday a halt to construction work on the Gazprom-led South Stream pipeline project planned to bypass Ukraine as a transit country and consolidating Russia's energy grip in Europe. Plamen Oresharski said after meeting U.S. Sens. John McCain, Christopher Murphy and Ron Johnson that he has ordered all work on the disputed project to continue only after consultations with Brussels. Last week, the European Commission opened an infringement procedure against the Balkan country and asked construction work to be stopped, arguing that Bulgaria hadn't respected EU internal market rules covering the award of public contracts. The standoff over Ukraine has forced the 28-nation EU into a sudden rethink of its energy policies to make it less reliant on Russia and its state-owned gas company Gazprom. The planned US-EU trade deal, the Transatlantic Trade and Investment Partnership (TTIP), has come up against intense criticism from both sides of the Atlantic. Now development officials have joined the choir, and are warning that the agreement will undermine the UN's post-2015 development agenda. EurActiv Germany reports. As if the quickly approaching deadline for the UN's post-2015 development goals were not enough, experts have warned that the planned Transatlantic Trade and Investment Partnership (TTIP) between the EU and the US threatens to contradict global development targets. 2014/06/13: Hypergeometric: "A present threat to national security"
New York's Union Theological Seminary--home to famed theologians Paul Tillich, Reinhold Niebuhr, and Dietrich Bonhoeffer, as well as a $108.4 million endowment--will be the first seminary in the world to divest from fossil fuels. 2014/06/14: JFleck: California: a young state's first drought, "an abundant crop of irrigation schemes"
2014/06/12: JFleck: Is the "iron triangle" in western water management still a relevant concept? The assertion in a new report on California's long-term water woes likely comes as no surprise to most Californians "A dry 2015 would have disastrous consequences for agencies and sectors up and down the state." Flooding, more than heat-related weather events, influence UK residents' perception of the risks associated with climate change, a survey has shown. Researchers found that British people perceived heatwaves had become less common in their lifetimes, while flooding had become more common. The UK's energy market "does not work", according to the head of the country's transmission system operator. Market intervention is therefore needed to ensure that low-carbon energy generation and security of supply are properly valued, he said. Climate minister Greg Barker says flagship UK green fund will be allowed to invest in developing countries The UK government has announced plans to allow its national Green Investment Bank to back projects in developing countries, using money from the UK's £3.87bn International Climate Fund. The second round of the government's Green Deal energy saving programme for homeowners opens on Monday. The Green Deal Home Improvement Fund offers cashbacks and incentives on such things as double-glazing, insulation and boilers. Cooperation to improve Europe's energy security must not come at the expense of the resilient, competitive and low carbon energy system we need for the future, writes Nick Mabey. Polluting industries are earning windfall profits which may ultimately undermine them says UK report The European Union's emissions trading scheme may be over-compensating heavy industry, allowing windfall profits which may stifle competitiveness in the long-run. Denmark to pass climate change bill into law, putting its 2020 ambition at twice the EU Denmark is set to pass its climate change bill into law on Wednesday, binding it to reducing its emissions 40% by 2020. Grants designed to protect the countryside may be controversially switched to pay England's farmers to grow beans and peas. The EU's new rules on subsidies oblige farmers to ensure that some of their land supports wild plants and animals. But during negotiations, farmers watered down the policy so planting crops that improve soil may be counted as helping wildlife. Wildlife campaigners have expressed outrage at the potential move. Armed with a new sense of urgency to fix the problems of power supply, rising power costs, and increasing dependence on imported coal, the Narendra Modi-led Indian government is planning to enhance the country's ambitious National Solar Mission. Currently, the mission entails installation of 20,000 MW of grid-connected and 2,000 MW of distributed solar power capacity by 2022. India's domestic spy service has accused Greenpeace and other lobby groups of hurting economic progress by campaigning against power projects, mining and genetically modified food, the most serious charge yet against foreign-funded organizations. The leak of the Intelligence Bureau's report comes as Prime Minister Narendra Modi's new administration seeks way to restore economic growth that has fallen to below 5 percent, choking off investment and jobs for millions of youth entering the workforce. 'We saw a wall of water hit those who were on the banks,' said one witness Rescuers in rafts and boats were searching a Himalayan river Monday for dozens of Indian students swept away when a dam released a rush of water without warning, and police said four bodies had been found. The 25 students from the southern city of Hyderabad had been taking photographs Sunday evening on the banks of the Beas River when they were hit by the rush of water from the Larji hydropower station near the mountain resort town of Manali in Himachal Pradesh. They had been part of a larger field trip of some 48 students spending 10 days near Manali. Some students at the river managed to scramble to safety. 2014/06/11: Eureka: China today: Culprit, victim or last best hope for a global ecological civilisation? Rumoured peak in Chinese emissions would still be insufficient to put China on 2C pathway Chinese carbon emissions will continue to rise at current levels even if the carbon cap suggested by a Chinese official last week is implemented. A rumoured peak of 11 gigatonnes of CO2 by 2030 would keep China on roughly the same course paved by its current policies, according to new analysis released on Saturday by Climate Action Tracker. Colombians are preparing to vote in a runoff election between the incumbent president and a conservative rival. 2014/06/12: CPunch: The Chue Bus -- Support the Latin American Climate Caravan Action-Tour! Australia's electricity demand has fallen sharply again, with the market operator conceding that power consumption will fall 3.1 per cent below even its most recent downgraded forecasts - made just in November. Queensland Deputy Premier Jeff Seeney will determine the fate of a controversial wind farm proposed on the far north's Atherton Tableland. Mr Seeney has informed the Mareeba Council he's decided to 'call in' the development application to establish 75 wind turbines at Mt Emerald, about 100 kilometres west of Cairns. The Palmer United Party has backed down on demands that the carbon tax repeal legislation be applied retrospectively, in a move that boosts the chances of the bill passing the Senate. The party's leader, Clive Palmer, still thinks companies should be entitled to a full carbon tax refund, but says he is prepared to "compromise". The 30 per cent cut to Landcare in the Federal Budget, totalling nearly half a billion dollars, is not a sign of lack of support in the National Party, says NSW MP Mark Coulton. A traditional land owner has yelled and sworn during a Federal Court hearing examining plans to build a nuclear waste dump in Central Australia. Bunny Nabarula, a Milwayi woman, stood up and cursed before the court as she vented frustration over the kind of legacy a facility for storage of low and intermediate-grade nuclear waste at Muckaty Station, near Tennant Creek, would be for future generations. She told a special sitting of the court, on country, that she was passionate about keeping her land pristine and a $12 million compensation package was "dirty money". President Barack Obama's bid to cut power-plant emissions in the U.S. is all talk and no action, Australia's chief trade deals negotiator said. "Despite the rhetoric you get over here and all the targets for 30 percent reductions and all this, it's just rhetoric," Trade Minister Andrew Robb said in a Sky News interview from Houston, Texas, where he was visiting alongside Australian Prime Minister Tony Abbott. "There's no action associated with it." Labor says Prime Minister Tony Abbott has conceded the fuel excise is a "carbon tax on steroids" following remarks about the scheme the PM made in the US. Mr Abbott told US president Barack Obama during wide-ranging private discussions in Washington the fuel excise, which the Government announced would increase in the budget, was acting like a carbon price signal. Earlier this week, the satirical website The Shovel had this amusing headline: Abbott commits to cutting Australia's reputation by 30 per cent by 2015. It could well be Abbott's most ambitious climate goal yet, and he's probably already achieved it. NSW agriculture services face a cut of between 20 and 30 per cent because of federal Landcare cuts. Environment Tasmania says the Federal Government has yet to improve the transparency of fisheries management following the supertrawler debate. The Federal Government claims farmers will be the big winners out of its Direct Action Policy, as they stand to directly benefit from the Emissions Reduction Fund. It's set aside $2.55 billion for the Fund, which farmers are encouraged to apply to for carbon farming projects like tree planting, innovative cropping, and capturing methane from effluent ponds. But experts say the lower price for carbon, after the Carbon Tax is abolished, simply won't be worth farmers' efforts. Tony Abbott's language so far on his overseas tour betrays a complete lack of connection between what climate change is and what it might do, writes Jonathan Green. 2014/06/12: TheConversation: 'Clobbered': does Abbott care about Australia's international standing on climate action? Australia has the infrastructure in place to lead us to the kind of cleaner future envisaged by Barack Obama. So why is Tony Abbott keen to dismantle it? Anger, concern and confusion were just some of the prominent emotions as eastern Victorian landholders and community members turned out in big numbers for a series of onshore natural gas consultation sessions. The highly charged debate around the development of an onshore gas industry has been the subject of significant community angst in the state's Gippsland region. The Abbott government and leading business figures in northern Queensland have thrown their support behind a proposal to spend $1.8 billion on a new coal-fired generator in the region. Which might sound like a good idea, as long as you close your eyes and ears. Joe Hockey tried to manufacture a fiscal budget emergency when there wasn't one, whilst the real budget emergency - the climate carbon budget emergency - remains hidden from view. The brutal reality we now face is that, practically speaking, there is no longer a "carbon budget" for burning fossil fuels while still achieving a two-degree Celsius (2°C) future; and the 2°C cap is now known to be dangerously too high. This challenges the international community's climate policy-making paradigm. The CSIRO will cut more than 30 jobs from its Marine and Atmospheric Research (CMAR) division over the coming weeks. In a letter to the CSIRO staff association, management states that it will cut 31 full-time equivalent positions, the vast majority of them research scientists. Another 18 scientists have lost their jobs at the CSIRO in Hobart, this time due to cuts in the federal budget. In the past week both the US and China have revealed ambitious schemes to tackle climate change, putting Australia on the outer when it comes to taking action. This could make for awkward conversation when Tony Abbott meets Barack Obama this week, writes Frank Jotzo. Three and a half years after Carnarvon was devastated by record floods, a series of new levees will be unveiled in the town today. A $60 million project will see an extra 26 gigalitres of water, re-directed into the Coorong, in South Australia, every year. The 'South East Flows Restoration Project' aims to reduce salinity levels and therefore improve conditions for native wildlife and wetlands in the region. The World Heritage Committee meets next week to determine the protection status of Tasmanian forests and the Great Barrier Reef. Our international reputation is at stake. A leading Tasmanian timber industry group is lobbying against the Federal Government's bid to remove some native forests from the World Heritage Area. The Australian government will attempt to delist part of Tasmania's forests from UNESCO's World Heritage List. The owner of Australia's Hazelwood brown coal generator, one of the country's biggest emitters, has claimed that the cost of solar PV is unlikely to fall in future years. In an extraordinary submission to the RET Review panel on its modelling assumptions, GDF Suez suggests that solar PV is unlikely to reduce costs because many panel manufacturers continue to lose money. After months of doom and gloom, a cautious optimism is emerging that Australia's large scale renewable energy target will not be scrapped. A union official from Victoria is warning against the sale of the New South Wales electricity distribution network. The Victorian President of the CFMEU's Energy Division Luke van der Muelen says promises of cheaper power, better services and better competition all turned out to be false when the Victorian network was privatised in the late 90's. 2014/06/10: RNE: Sale of NSW energy networks: Is this a lemon? The New South Wales Nationals have signed off on a deal to back the Baird Government's plan to partially sell off the state's electricity infrastructure. The Nationals have agreed to a partial privatisation provided the company Essential Energy is kept out the mix. Princeton researcher measures leaks that risk groundwater, and increasingly the climate. BC gas commission says it is dealing effectively with leaks Up to 10 per cent of B.C. natural gas wells are leaking and some have become "super-emitters" of methane, which is an environmental and health concern, says a new report. Wells can leak from their drill holes as gas can travel along gaps and cracks in the cement that is used to plug the hole between the steel pipe and the underground rock surfaces, says the 69-page report authored by three University of Waterloo scientists. For environmentalists lobbying against the Keystone XL pipeline through the U.S., a made-in-Canada option might pose a bigger problem. In its entirety, Plan B consists of Enbridge's Northern Gateway and Line 9 projects; TransCanada Corp.'s proposed $12-billion Energy East pipeline, extending 4,400 km from Alberta to refineries in Eastern Canada; and Houston-based Kinder Morgan Inc.'s proposed $5.4-billion expansion of its Trans Mountain pipeline to ship Alberta heavy oil to B.C. ports. 2014/06/11 Tyee: If Oilsands Crude Can't Get to China, then Europe Instead? Rumoured Enbridge oil shipment to Spain 'tip of the iceberg,' says Calgary analyst. "We have drawn a line in the earth they cannot, and will not, cross," said Chief Martin Louie of the Nadleh Whut'en First Nation. 2014/06/09: BCLSB: Northern Gateway To Be Delayed? Deadline looms for federal government's decision on $7-billion pipeline project Some time in the next 10 days, the federal government is supposed to announce its final decision on the Northern Gateway pipeline -- the multibillion-dollar political minefield dividing the West. TransCanada Corp. says it plans to build a $1.9-billion pipeline to help feed Chevron Corp. and Apache Corp.'s proposed liquefied natural gas facility near Kitimat, B.C. The Merrick Mainline Pipeline Project will run 260 kilometres from Dawson Creek, in B.C. 's resource-rich northeast, to Summit Lake, where Chevron and Apache's Pacific Trail Pipeline begins. Pacific Trail will deliver gas the rest of the way to the coast, where the resource will be chilled into a liquid state and exported abroad via tanker. 2014/06/13: AlexandraMorton: Going to Court to Stop Spread of Disease -- Is Canada's Aquaculture Licence Safe for Wild Salmon? Biologist takes issue with transfer of virus-infected fish into wild salmon waters. 2014/06/11: Tyee: Who's Behind BC's New $10-Billion Refinery Bid? Canada's Pacific Coast, where locals are opposing exports of oil-sands crude, has attracted another refinery proposal long before the supplies can reach the shore by pipeline. Pacific Future pitches 'world's greenest' First Nations-friendly refinery proposal A Vancouver company is pitching a $10-billion oilsands refinery on British Columbia's north coast that aims to connect Alberta's vast energy resources with Asian markets, while avoiding some of the pitfalls others have encountered. Pacific Future Energy Corp. says the refinery would be the "world's greenest" and built in full partnership with B.C. First Nations, many of whom are vehemently opposed to proposals to ship crude to the West Coast for export. Statoil Canada and the province of Newfoundland and Labrador will spend $3.9 million to help advance contentious oil and gas development in harsh environments, including the Arctic. Statoil said Tuesday it will spend $2.4 million on three new research projects, while Crown corporation Research and Development Corp. will spend $1.5 million. 2014/06/12: CSM: Is the nation's 'greenest' utility green enough? Boulder says no. Boulder, Colo., wants to municipalize arguably the nation's "greenest" utility, Xcel Energy, saying that it is not nearly clean enough - too much of its power still comes from fossil fuels. Now their three-year-old battle is going to the courts. New law creates climate council and seeks to protect islands from threat of rising sea levels Hawaii has passed a law to protect the state against the impacts of rising oceans and dying coral reefs. 2014/06/10: Grist: Will Obama's power-plant rules lead to an international climate agreement? Historically, American conservatives opposed many social advances -- then abandoned their resistance when the reforms proved unstoppable, and popular. Soon, we predict, retreat will be seen in a different field: right-wing opposition to evidence of climate change. As scientific proof of global warming grows ever more solid -- and abnormal weather grows ever more violent -- we expect conservatives to go through another shut-up-and-back-off withdrawal. Louisiana Governor Bobby Jindal has flouted the advice of his own attorney general and scores of legal scholars by signing a bill which blocks a levee board's lawsuit against oil and gas companies, who are accused of destroying the state's coast. 2014/06/09: TP:JR: Florida Congressman: If Humans Cause Climate Change, Then 'Why Did The Dinosaurs Go Extinct'? Shocking upset set to change Washington In an upset for the ages, U.S. majority leader Eric Cantor of Virginia, the second-most powerful man in the House, was dethroned Tuesday by a little-known, Tea Party-backed Republican primary challenger carried to victory on a wave of public anger over calls for looser immigration laws. Potential 2016 Presidential candidate says environment cannot be relegated behind economic concerns Promoting economic growth over the environment is a "false choice" that stores up problems for future generations, warns Hilary Clinton in her new book, Hard Choices. 2014/06/14: PSinclair: Obama Turns Up Heat: Climate Deniers are "Radical Fringe". Republicans will try to block the Environmental Protection Agency's proposed greenhouse-gas rule by denying the funding to implement it, according to a senior member of a U.S. House appropriations panel. The funding ban "will be in Interior," Idaho Republican Mike Simpson said, referring to the spending bill being drafted for the Department of Interior and EPA. Simpson, head of the House's Energy-Water Appropriations subcommittee, formerly chairman of the Interior and Environment appropriations panel. the Obama administration's pledge to reduce ghg emissions is far short of the US fair share of safe global emissions. BP Plc investors claiming as much as $2.5 billion in market losses caused by company misrepresentations about the severity of the 2010 oil spill will make their case to a jury next May 18, a judge ruled today. The investors, led by the pension funds of New York and Ohio, claim the company inflated share prices by downplaying the size of the spill in the weeks after the blowout of BP's Macondo well in the Gulf of Mexico. Only investors who held ADR shares in the U.S. are part of the lawsuit. U.S. District Judge Keith Ellison in Houston first set the trial for October. He changed the date to avoid a conflict with a separate trial over as much as $18 billion in U.S. pollution fines BP faces in New Orleans federal court. That trial, set to begin Jan. 20, is the third phase of a multiyear trial to determine BP's liability for public and private damages from the worst offshore spill in U.S. history. A former BP Plc senior engineer found guilty last year of destroying evidence related to the 2010 Gulf of Mexico oil spill was granted a new trial based on his claim of juror misconduct. Kurt Mix was convicted by a federal jury in December of one of two counts of obstruction of justice. Prosecutors said Mix deleted from his mobile phone text messages and voice mails related to BP's effort to estimate the size of what turned out to be largest U.S. offshore oil spill. The US Supreme Court has refused to allow BP to stop paying compensation claims while it awaits a review of its settlement with businesses over the 2010 Gulf of Mexico oil spill. 2014/06/11: Resilience: Are You Ready for a Coal Town Turnaround? 2014/06/10: TreeHugger: Is there a renewable energy secret in your cup of coffee? 2014/06/08: RI: Talkin' trash: Are we literally throwing away energy? 2014/06/08: Resilience: Talkin' trash: Are we literally throwing away energy? 2014/06/09: RealEconomics: China asks how much will it cost to make solar cheaper than coal? "Ignoring the potential increase in methane pollution from future LNG exports won't make climate change go away -- it will only make its impacts more deadly." Global energy analysts say natural gas faces growing competition with coal and renewables Natural gas demand growth fell last year and rising U.S. production "abruptly slowed", the International Energy Agency said on Tuesday, showing a pause compared with previous breakneck growth. California's government agencies aren't ready to handle the safety risks accompanying a boom in oil shipments by train, the state said in a report this week. The warning comes even as the most populous U.S. state declines to disclose oil-by-rail data handed over by Burlington Northern Santa Fe on June 9. The railroad company deemed the summary of its oil shipments "sensitive security information" containing confidential trade secrets. It's only available to public safety agencies until the Governor's Office of Emergency Services determines whether it's confidential. 2014/06/11: Grist: When cranky crude rides the rails, who should know? A small terrace house in the inner Sydney suburb of Glebe is hosting what is believed to be the world's first building integrated solar system that generates electricity as well as heat. 2014/06/11: CleanTechnica: Perovskites: The Future of PV? Using molten salt to store electricity offsets the high cost of solar thermal power, says report The ability of solar thermal power to store electricity confers huge grid management benefits which help offset its high up-front cost, a US government report calculated this week. 2014/06/10: TreeHugger: Solar boom! From 5 GW in 2005 to almost 200 GW by the end of this year, and this party is just starting! Gas-rich Gulf state opens its 'state-of-the-art' solar panel facility. Switzerland's Federal Office of Public Health has announced that it will be examining former watchmaking workshops in the Jura region for radioactivity over the next year. The school's prized fusion reactor was dead; its federal funding axed. Then its political allies went to work. 2014/06/13: RNE: What is Google plotting for the smart grid? National Grid is offering to pay companies to cut their electricity use in winter to prevent blackouts. The firm, which runs Britain's supply network, is seeking customers who can cut consumption or switch to backup services during peak demand. Volkswagen's limited production diesel-electric hybrid gets 260 mpg and emits one-tenth the greenhouse gas that the average U.S. car does. The world's most fuel-efficient car has just arrived on dealer lots in Germany and Austria, but don't expect it to be sold in America anytime soon. 2014/06/11: ERabett: Nasal Glazing or Eli Too Has a Question - Is there anyone on the other side of this who deserves respect? 2014/06/09: UKISS: It's all so obvious! AGW is a hoax...no really! There are three things we know about man-made global warming. First, the consequences will be terrible if we don't take quick action to limit carbon emissions. Second, in pure economic terms the required action shouldn't be hard to take: emission controls, done right, would probably slow economic growth, but not by much. Third, the politics of action are nonetheless very difficult. But why is it so hard to act? Is it the power of vested interests? I've been looking into that issue and have come to the somewhat surprising conclusion that it's not mainly about the vested interests. They do, of course, exist and play an important role; funding from fossil-fuel interests has played a crucial role in sustaining the illusion that climate science is less settled than it is. But the monetary stakes aren't nearly as big as you might think. What makes rational action on climate so hard is something else -- a toxic mix of ideology and anti-intellectualism. 2014/06/14: P3: Wherefore art thou Climate Change? 2014/06/09: ATTPh: You're doing it wrong!